From the Billings (MT) Gazette, of all places, comes an interesting article of the perils of the upcoming busy season for retailers. It’s a good reminder that there are bad guys (and gals) out there who want to literally steal your hard-earned profits. The next few days before Thanksgiving might be a good time to sit down with your staff and review your security policies. Remember that shrinkage comes right out of the bottom line. If you work on a 10% net profit, for every dollar that’s stolen from you, you have to do an additional $10.00 in sales to make it up. Obviously, the loss of a $200.00 item means you need an additional $2,000.00 in sales. It goes without saying that you should keep an eye on your merchandise. November and December are also no time to get lax about credit card sales and about taking checks. If you don’t have a formal security plan, now’s the time to make one and be sure that everyone who works in your store knows what it is. That includes repair techs and delivery people as well as those who work in the store. About.com provides links to some articles on the topic of retail security that you might want to read. National Retail Federation Foundation. Today we take a look at Stanyon’s second Challenge (opportunity). Difficulties in product sourcing and merchandise acquisition. If you’re a Tacony Corporation customer, this shouldn’t be a problem for you. Stanyon cites (1) shrinking vendor structure (2) vendor minimum orders for single shipments and minimum annual purchases and (3) quantity pricing as issues which make it difficult for the independent to compete. He says that "Manufacturer and distributor consolidation and the channel crossing of products are causing many problems for small independent retail." Standardized products and the pressure for manufacturers to sell through multiple channels are two problems that Stanyon mentions. He goes on to say that independent retailers can take advantage of sourcing new manufacturers and suppliers who are looking to establish themselves with innovative new products. We couldn’t agree more. This may be shameless self-promotion, but Tacony Corporation began as an independent retailer sixty years ago. Through the years we’ve grown our business by providing protected brands that the independent retailer can sell without fear of their customers seeing the same thing at the big box store down the street. To be fair, we’re not the only manufacturer to do this, but many others have chosen a different approach to the market. As a family-owned company, we don’t have the pressure from stockholders to constantly increase the value of their holdings. We put pressure on ourselves to continually come up with new, innovative products and better, more efficient ways to serve our customers. Our goal is to be the best, not the biggest. Stanyon says that "another important aspect of the product sourcing challenge is often the need to establish an anchor brand to provide added credibility for other desired suppliers." Unfortunately, many of those "anchor brands" are sold through multiple channels and offer profit margins that aren’t acceptable. They become victims of their own success. Their credibility comes from national advertising and wide distribution, which drives the price down making the product unprofitable for the smaller store. One of the means for a dealer to increase profit margins is membership in a buying group. Buying groups provide purchasing power and other benefits. Their downside is that the dealer loses a certain amount of control by being a member. A diversified supplier who specializes in the independent retailer market, not selling protected brands to mass merchants, provides many of the benefits of belonging to a buying group without the limitations. In summary, it’s important that the successful retailer be a good shopper. Work with your vendors, whoever they are, to increase your business. Keep your inventory fresh by bringing in new products whenever possible. Work with your manufacturers’ sales force to come up with new promotions, new in-store displays, and anything else that will increase your business. Ask them what’s working for other dealers in other towns. Network with other retailers at trade shows and conventions and don’t overlook those in other, non-competing industries. The lawn and garden store, or the bicycle shop, or the bakery has many of the same problems that you do and you might just be able to brainstorm and give/get some good ideas. No, not the Christmas season. Not the hockey season. Not the college basketball season. It’s all of those, but it’s also cold and flu season. One of the ironies of the retail business is that the busiest time of the year coincides with beginning of the period when there’s the most illness. Everything moves indoors, at least in the cold-weather states, bringing germs and viruses inside too. Business picks up and you’re surrounded by coughing, sneezing customers. Staff calls in sick, putting more pressure on everyone else, who get run down and soon they (and you) are sick too. It’s a vicious circle. Bob Negen, on his WhizBang! 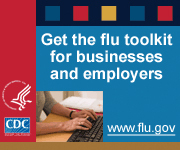 Training web site offers some good sense tips on cold and flu prevention. Keep a bottles of "waterless hand cleaner" at every work station. This is the same stuff that hospital staff use between patients. Make sure everyone uses it regularly. Clean the cash register, computer terminals, door handles, and anything that people regularly touch with a disinfecting cleaner. It’s available as a spray, or as pre-moistened towelettes. Make sure the restrooms are stocked with plenty of paper towels and anti-bacterial soap. Consider paying for a flu shot for you and your staff and give them paid time to go and get it. It’s cheap insurance. Make sure you set the example for everyone else. This one is mine. Don’t let yourself or your team get run down. It’s tempting to put in lots of hours at this busy time of the year, but if you don’t take care of your nutrition, exercise, and sleep needs, you’ll get sick and the net result will be less hours worked, not more. The same holds for your people. For most of us, it’s a long winter and taking care of your health will keep it from seeming even longer. Remember, it’s only three and a half months until pitchers and catchers report for spring training. National Retail Federation Foundation. We’ve covered all of the trends Stanyon identified, today we look at the first of the "Challenges". I wish he had referred to these as "opportunities" rather than "challenges" because they really are opportunities for you to build your business. I hope you agree. and effectiveness of marketing and advertising. listening. There are many others. on consumers who want to improve the looks and comfort of their homes. You get the idea. saved time is check their email and surf the Internet.That’s where they should find you. When they search Google for your type of business, are you listed? Have you signed up for the free coupon service that they offer? Today, these things are critical. search advertising, and event sponsorships. Of course, word-of-mouth is the most cost effective method of all. another channel, and of those who do see it, most won’t be interested. know someone that they can refer to you. Last week my wife and I had dinner with our financial advisor. We, along with eight other client couples met at a local restaurant. There were two reasons for the dinner. One was to thank us for our business and the second was to get our advise on how to improve the host’s customer service. He called us his "board of directors". It’s an ingenious idea. Who knows better how to improve customer service than the customers themselves? Doug received several suggestions that he promised to incorporate in his business. A former member of the Clinton cabinet. Each of these people brings expertise to the company that might not be available internally. Why not have your own board? It could be made up of some of your best customers. You might add your banker, someone who works in advertising, or other retailers. Use your imagination. People like to help and to be recognized as someone with a valuable opinion. For the cost of a nice dinner you could get some incredibly helpful ideas. cooperative alliance has been the basis of nearly every great fortune. a third,invisible, intangible force which may be likened to a third mind." Even though Hill’s book was written nearly seventy years ago and was based on work he did many years before that, it remains a consistent best seller even today. How often you meet with your "board" is up to you. You might have one formal get-together each year with a nice dinner, and a more informal lunch-time meeting twice each year or even quarterly. Some members may lose interest which isn’t necessarily a bad thing because that gives you an opportunity to bring in new ideas from time to time. You’re in competition with companies that have their own boards, shouldn’t you have one too? In a recent post, Sara Fitts writes on the hiring process and offers seven tips to follow. "Know why you need the position you are filling." This is an excellent time to review all of your personnel needs. Just because you’re replacing someone doesn’t mean that the new person has to have exactly the same duties. Could a new person take some of the load off your shoulders? Are there some skills that your company is lacking that you might find in a new hire? "Identify 5-10 characteristics that you must have in the person you hire for this position." This could be the most important point of all. Product knowledge can be learned. Procedures can be learned. But, personality is pretty much a given. There’s an old saying, "You can’t fix stupid." You also can’t change who a person is. If a new hire’s personality clashes with everyone else’s, you will have an unhappy, unproductive workplace. You, and your team, spend a lot of time at work. When you make your list, be sure you include things like enthusiasm, energy, sense of humor, or any other personal qualities that will make sure your new team member fits in. You, your new hire, and your current staff will be happier and more productive if you do. "Write the job description-and list every detail involved." There’s a time and a place for surprises, but after you’ve hired someone is no time to find out that they can’t (or won’t) do something that you just assumed was part of the deal. If it’s in writing, and if it’s discussed up front, then there won’t be any misunderstandings later. "Post the vacancy broadly enough to get a good sample of talent." The local classified section isn’t the only place to find good people anymore. If fact, it may be the worst place to find people. Internet job sites are a good place to look. Also, don’t forget your customers, your friends, and your business associates. The vast majority of job openings are filled without ever placing an ad. "Interview all candidates in the same day if possible." This one may not be possible, but it is easier to compare applicants if there’s not a big gap in your interviewing process. No matter how long the process takes, make a lot of notes. "Make your hiring decision as if your life depended on it-because the wrong person in the position can make your life miserable"
"Evaluate performance on a regular basis." You should be able to tell fairly quickly if the new person is working out. Do yourself, and the new hire, a favor and cut your losses if things aren’t working out. If it turns out to be a good fit, review often to catch little problems before they turn into major issues. ending what was then called the Great War, “the war to end all wars”. Today we know it as World War I.
that in 1975 it was moved back. Sadly, the day seems to have lost some of its significance, in spite of the fact that so many of our young people are in harm’s way today. Hopefully all of us will take some time this weekend to think about the sacrifices that have been made and are being made today to protect our freedom.